Cact. Succ. J. Gr. Brit. xix. 67 (1957). Origin and Habitat: Mexico (mainly states of Querétaro, Tamaulipas and Veracruz). Type locality: Near Victoria, Mexico. Habitat: Pilosocereus palmeri inhabits tropical deciduous forest, xerophyllous scrub, and submontane forest. It germinates in the shade of plant canopies and in soil-filled rock crevices than in flat open areas. It is mainly bat-pollinated although to a lesser degree, diurnal visitors also caused some fruit set. It is partially self-compatible but unable to set fruit without visitors. The habitat of Pilosocereus palmeri is home to succulent flora and is particularly rich in local endemics such as: Acanthocereus pentagonus, Selenicereus pteranthus, Opuntia puberula and many other. It is widespread and common but threatened by localized small-scale deforestation for cattle and agriculture. 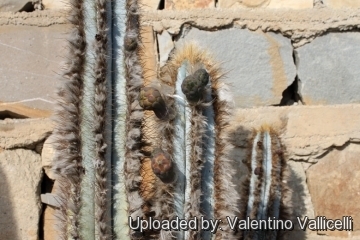 Description: Pilosocereus palmeri is is one of the several morphological or local forms of Pilosocereus leucocephalus. It is a beautiful and well known tree-like cactus that hardly needs an introduction, with its blue ribbed stem tufted in thick silky wool from which near the tops emerge short, funnel-shaped, flesh-coloured blooms. It flowers on and off throughout the growing season. The only drawback here is that the flowers have a very strong, foul smell. It is a popular plant even with non-cereus-minded growers. Habitat: It is a columnar, perennial cactus becoming a tree 2-6 m tall, more or less branched from below with well-defined short trunks (at times with up to 20 branches or more). Areoles: 1-1,5 cm apart, clothed from top downward for 20 to 30 cm with long white hairs 2-6 cm long. Older basal areoles, scarcely woolly. Pseudo-cephalium: The area where the flowers will grow is called a pseudo-cephalium, it is usually well defined, apical to lateral, involving three or four ribs. Flower-bearing areoles have much denser silky white hairs 4-10 cm long. Spines: Brownish, becoming grey with age. The spines of seedlings are often yellow. Radial spines: 7-12, slender, approx 1 cm long. Central spine: One occasionally 2, stronger, 2-3 cm long. Flowers: Tubular to bell shaped, 6-8 cm long, purplish to brownish outside, whitish to light pink inside, the ovary without spines or hairs. Outer segments purplish brown, inner segments pinkish. There is a large globule of nectar in the base of the flower. Blooming season: This cactus flowers during the warmest part of the year in asynchronous discrete pulses influenced by temperature, rainfall and plant size. Fruits: Spherical 4-6 cm in diameter, red, naked but the surface somewhat warty, with red pulp. They develop in a few weeks. Seeds: Black, shining, minutely pitted, 2 mm. Long, oblique at bases. 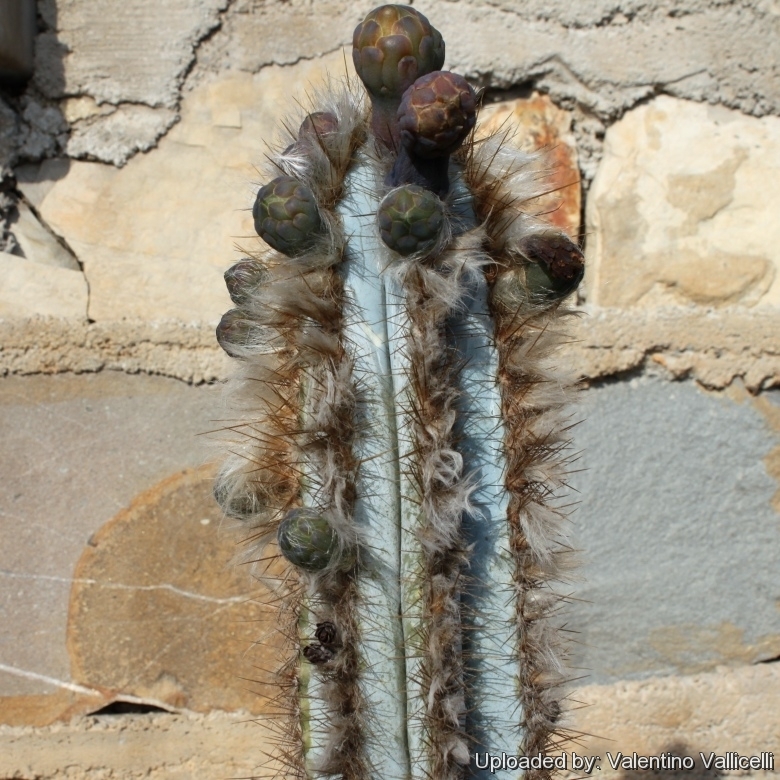 Remarks: It is a variable species and most plants found in cultivation labeled Pilosocereus palmeri look totallly unalike, some are a pale blue, some are a deep turquoise blue-green, some are a dull, dark greyish blue-green. Some are branched while others are solitary columns. About the only thing they all have in common is largish tufts of 'hair' near the tops, a condition certainly not unique to this species. 8) Ishiki, M., Arias, S. & Gómez-Hinostrosa, C. 2013. Pilosocereus leucocephalus. In: IUCN 2013. “IUCN Red List of Threatened Species.” Version 2013.2. <www.iucnredlist.org>. Downloaded on 15 March 2014. Cultivation and Propagation: Pilosocereus palmeri grows well and is a very vigorous growers (one of the quickest growing cactus), and is possible to increase the speed of growth to some extent by providing adequate amount of water, warmth, and an all-purpose liquid fertilizer diluted half strength during the active growing season, but it’s susceptible to rotting if too wet. It likes a sunny position also blasting sun in summer. If grown indoor provide 4 to 6 hours, or more, direct morning or afternoon sun. It should be watered regularly in Summer and kept drier in Winter. It like pots with generous drain holes, need a very porous, slightly acidic potting medium (add pumice, vulcanite, and perlite). It can be grown outdoors in frost-free climates, needs anyway to kept above 12 °C and dry in winter. But it can tolerate temperatures down to 5° C (or even 0° C) for very short periods if very dry and ventilated. Manteinance: Repot every two years.